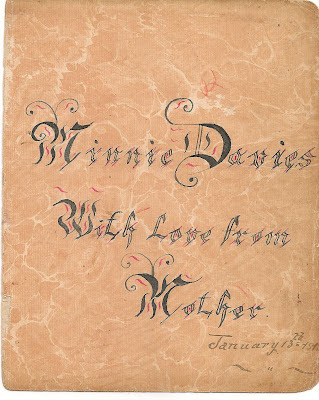 This is an autograph book which was given to my great-aunt, Minnie Davies, by her mother, on January 13th 1911. 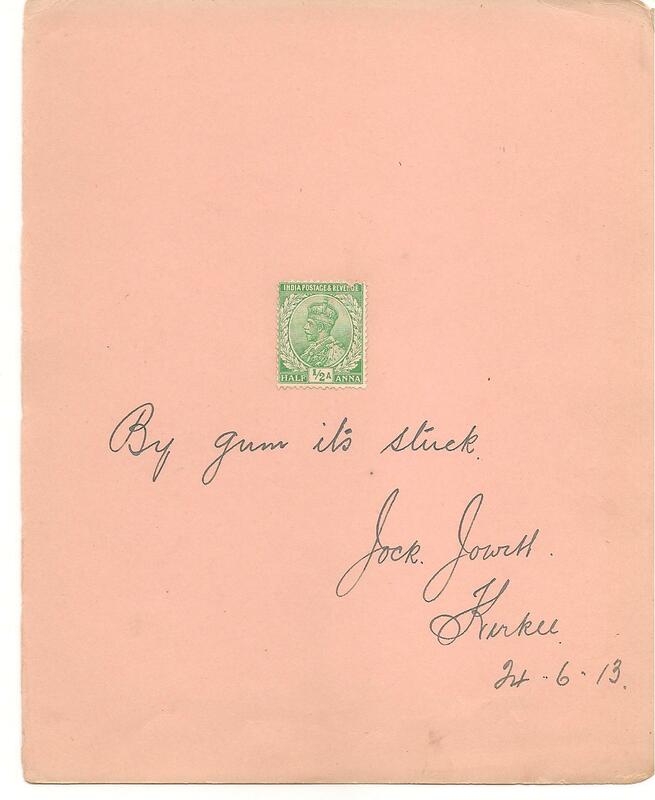 Or possibly not: the date below looks like 13th January1912; it's so close to the corner of the paper that it's hard to tell: but quite a lot of the autographs inside the book are dated 1911. Which is baffling - unless Minnie's mother gave her the book in 1911, but didn't get around to signing it herself for months? These things do happen. 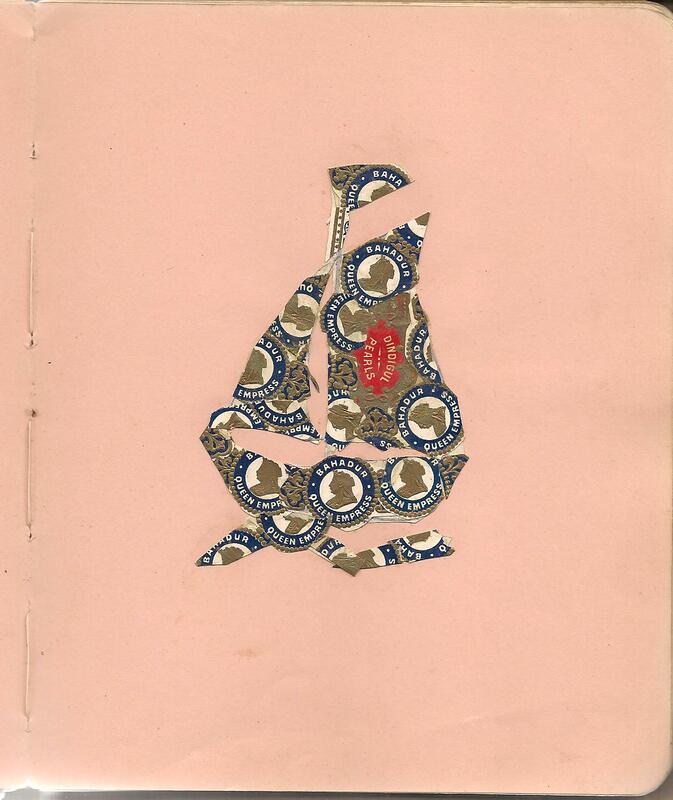 The book is covered in soft purple suede, with differently coloured pages in pale pink, cream and blue, and people seem to have dotted their autographs around the pages at random, maybe choosing by colour. A lot of the verses inside are somewhat Hallmark in quality. 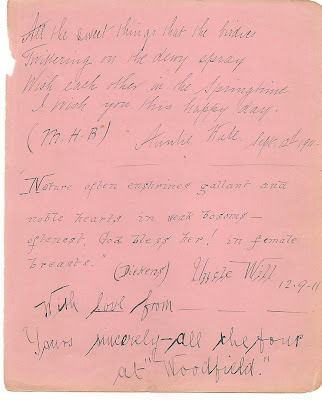 "All the sweet things that the birdies/Twittering on the dewy spray/Wish each other in the springtime/I wish you every day," writes 'Auntie Kate' on September 12th 1911. 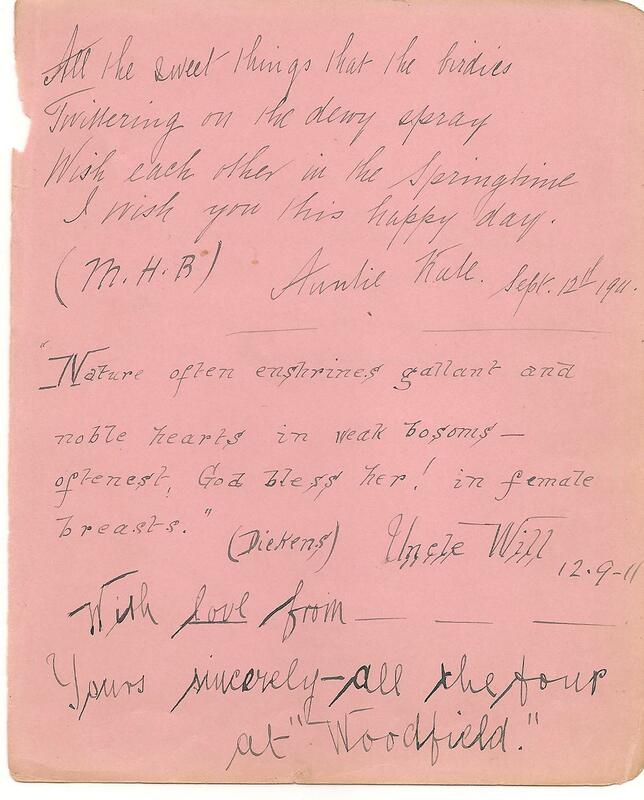 But 'Uncle Will', on the same day, writes more sternly underneath: "Nature often enshrines gallant and noble hearts in weak bosoms - oftenest, God bless her! in female breasts." (Dickens). 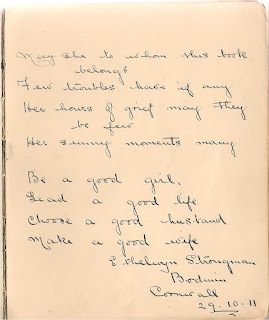 "May she to whom this book belongs/Few troubles have if any/Her hours of grief may they be few/her sunny moments many. Be a good girl/Lead a good life,/Choose a good husband/Make a good wife." but whoever did this one forgot to add their name. Romance creeps in. 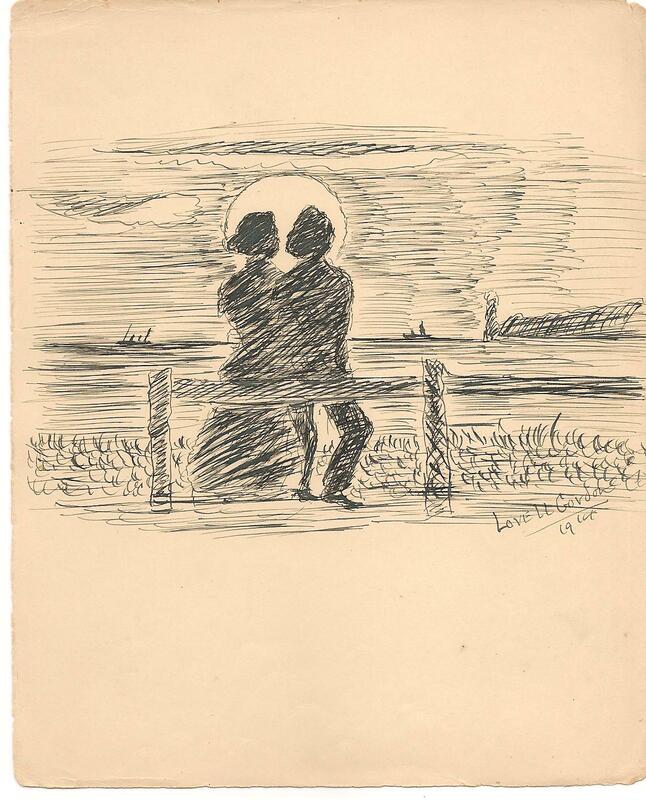 No importunate little boys in this pen and ink picture signed 'Love LL Gordon, 1914'. 'You can't stop the sun from beaming/You can't stop the birds' refrain./You can't stop yourself from dreaming,/You can't stop the drops of rain./You can't stop the stars from gleaming/Up in the heaven above,/And you can't stop your heart from beating/For the boy you love.' It could almost be a Cole Porter lyric. But the War to End All Wars was looming. Where was JF heading from or to, in 1916, I wonder, when he paused to carefully draw and paint this? 'Whitby Abbey (Bombarded by the Germans, Dec. 1914). What was he thinking of when he drew these? And I'm gwain away to the War. And give 'Molly Coddlins' the sack. 'Tion! Move to the right in four. 'Form fours'. Right. Forward, into the line. Dalhousie July - 1915 - Geo. E Hart. 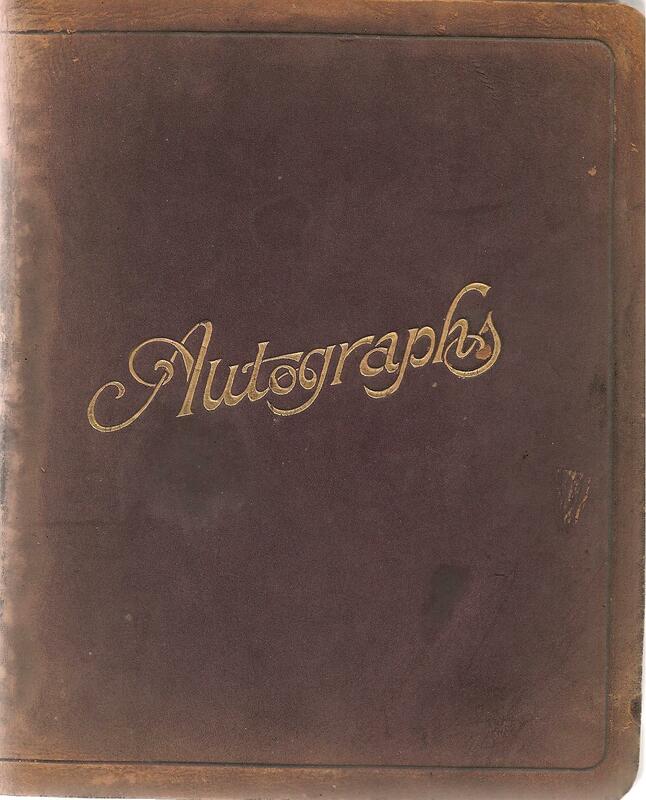 I'dforgotten about autograph books! Up to the Fifties every girl had one. After that I suppose we became too cool for such things. Lovely post. Lovely autographs. 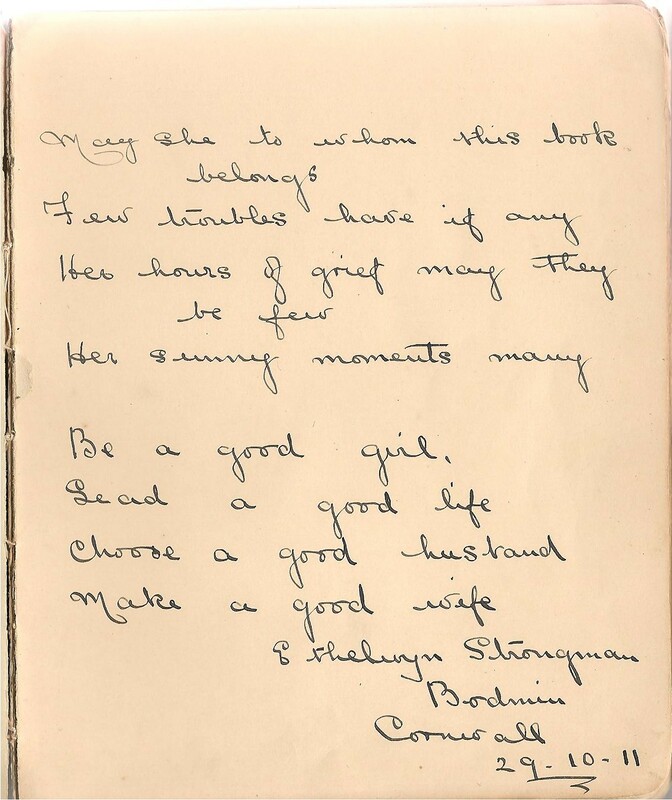 A lovely autograph book. My mother had one very similar, although starting in the 1920s. I've got it somewhere. I must dig it out! 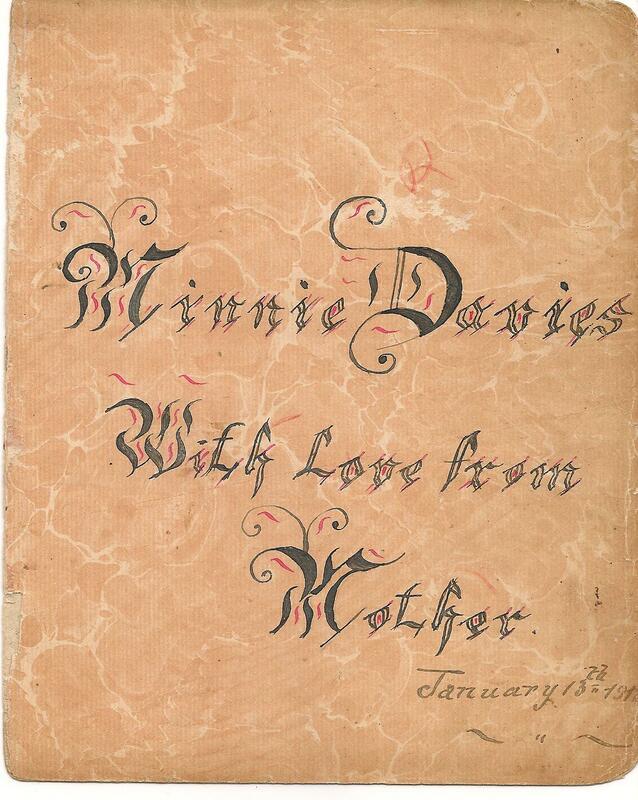 What an amazing document - and I loved Minnie's mum's calligraphy! Thanks for sharing this. Yet another treasure, Kath! I do worry that the media's frequent "de-clutter & sort out your life" bug strips many small historically interesting pieces from our lives. That, and the lack of cupboards. How cool to have this sort of window to the past! It's like a little time capsule, isn't it? 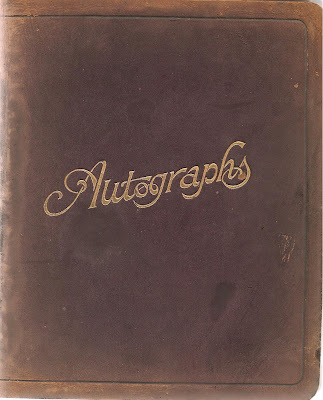 As Laurie says, these autograph books where still a big deal when I was a kid in the fifties - coloured pages and all. Everyone would vie to write the most flowery comments and there were quite a few standard verses, too. No idea what happened to my one, unfortunately! I'm so lucky to have a friend like you." As you can see, at that point the expected degree of sentimentality hadn't changed all that much from the late Victorian period! Yes, people did have a verse ready and prepared - at least my Mother did. I remember her writing in autograph books for me and my friends and she always put "The thunder roared, the lightning flashed and all the world was shaken/ the little pig curled up his tail and ran to save his bacon". oh... and the first person to write in a book always took up the LAST page with "By hook or by crook, I'll be last in this book". Actually I think those two were the only interesting snippets I ever collected. that's brilliant, Maryom! I rather thought people must have come prepared. 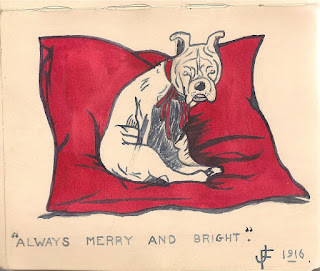 Annis - interesting that the Victorian rhymes were still being used in the fifties! I think there's a chapter on autograph books somewhere in Laura Ingalls Wilder's Little House on the Priairie series - I think it's 'Little Town on the Prairie' - a chapter in which the young teenage Laura has rashly made fun of her teacher, and Ma finally writes some wise comment in Laura's book, about watching what you 'think or speak or do'- I can't find the book, but can anyone confirm? How lovely! 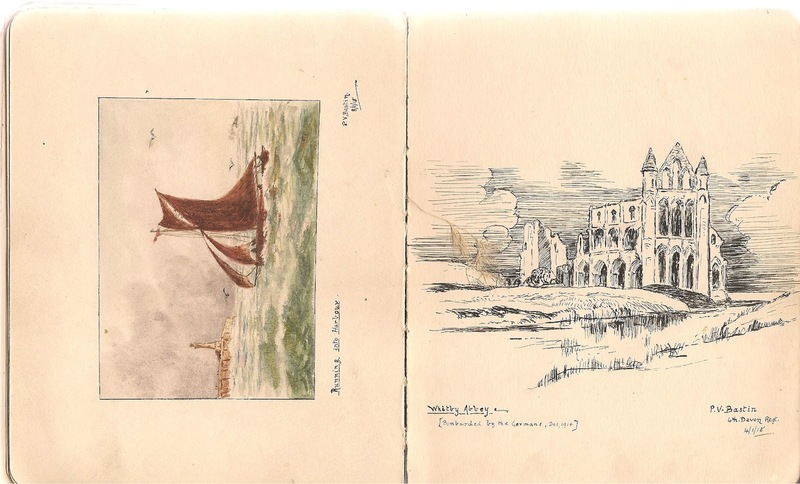 We have a couple of postcard albums from David's family - they are fascinating little pieces of history. I've never heard of this use of autograph books, although, of course, people sign each other's yearbooks, school uniforms when they leave school and SF convention programs. How amazing! You'd need to have a lot of time to wait around while they did the art. 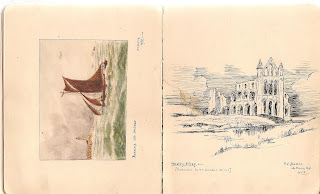 I once knew someone who had something similar in her autograph book from Keith Michell, who had visited her home while filming "Jacob And Joseph", with their family friend Julian Glover( her Dad was a journo who knew EVERYONE!) 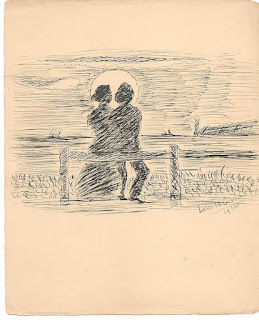 Keith Michell is good enough to sell his art and had no trouble sketching her portrait in her autograph book, with a poem about how they had things in common. He may have been old enough to remember when autograph books were used this way. And it is a time capsule, I agree. Just brilliant! Why am I not getting History Girls tweets on my timeline? I think I must have inadvertently stopped following them. Will correct..and tweet this! Just remembered another one from my old autograph book. I think this hoary quote from Charles Kingsley came to mind because even as a kid in the relatively unenlightened fifties I was less than impressed by the sentiment - as I recall the writer prompty dropped right off my BFF list! "Be good, sweet maid, and let who will be clever". So enjoyed your post, Kath. 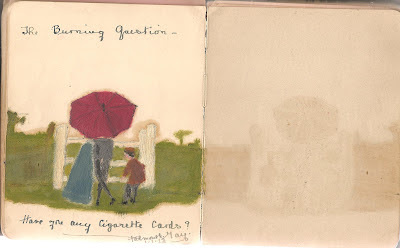 It made me take another sort of book off the bookshelf: The Illustrated Querist's Album that belonged to my grandmother. It's like an autograph book, but also has pages of printed questions that really bring to life the period. 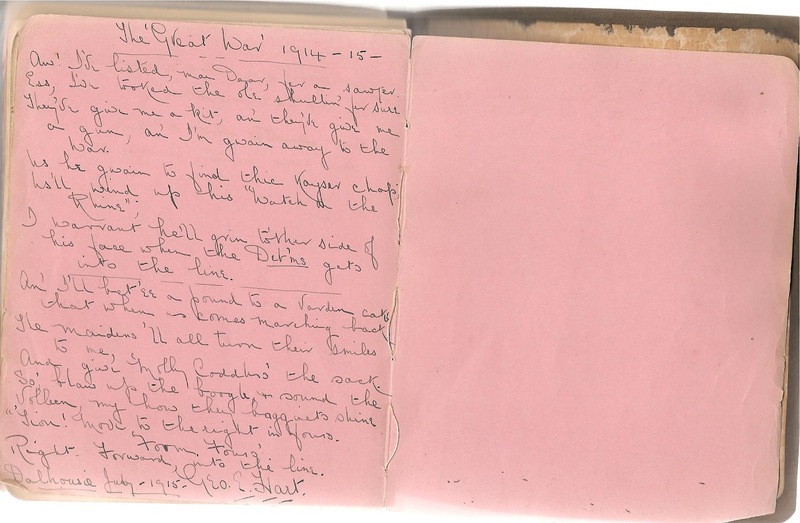 In 1915 Hilda wrote that her favourite woman was a suffragette and refers to herself as an 'old maid'. Whilst DB in 1915 (aged 15) defines an ideal man as 'plucky and loyal to his King', and his ideal woman as 'fashionable and pretty', and believes the most beautiful thing in nature is 'a horse'. 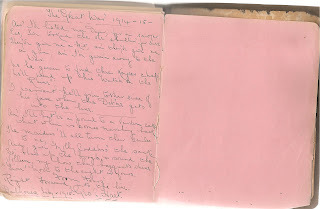 One of my grandmother's brothers, wrote in 1915 (age 22) that his idea of greatest earthly happiness was 'love' (though when asked if he'd ever been in love, the answer was 'No'; and did he believe in love at first sight 'Yes'). He said he greatest living orator was 'Lloyd George' and his favourite novelist 'H G Wells'. He answered that young men of the period were 'Generally too free' and that young women were 'In most cases too fast living' (a typical comment from many in the book). And then it's written that he died in France April 11, 1918. Such a poignant little book. This is lovely - what a thing to have and treasure. Thanks for sharing it. "If wisdom's ways you wisely seek, five things observe with care. To whom you speak, of whom you speak, and how and when and where."